So, I started googling and found this perfect recipe in Epicurious.com…. 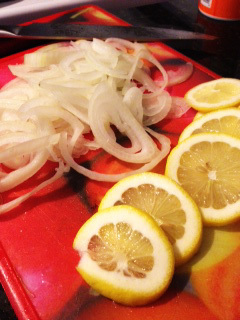 Cut 1 lemon into 8 thin slices. Squeeze juice from second lemon to measure 2 tablespoons; set slices and juice aside. Heat oil in large pot (I used a dutch oven) over medium-high heat. Add onion and sprinkle with salt and pepper; sauté until golden brown. Add next 5 ingredients; stir 1 minute. Add broth; bring to boil. Sprinkle chicken with salt and pepper; add to pot. Add lemon slices. 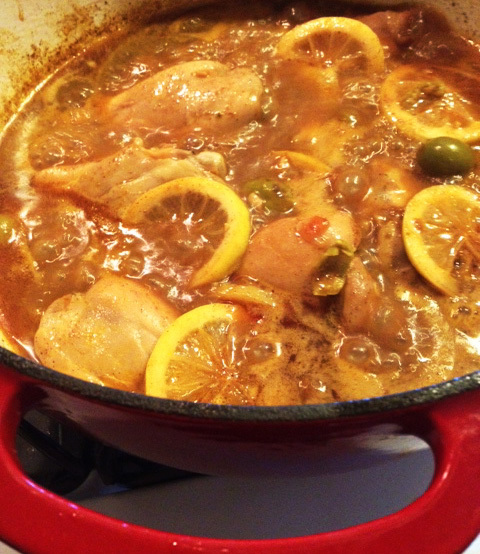 Cover, reduce heat to medium-low, and simmer until chicken is cooked through, turning occasionally, 25 to 30 minutes. Add olives and 2 tablespoons lemon juice to pot. Increase heat to high; boil uncovered to thicken slightly, about 5 minutes. Taste and season with salt and pepper, if needed. El otro dia vi estos encuentros de pollo sin piel en el supermercado y los tuve que comprar porque me recordaron a esta receta Marroqui que probe una vez y me dio un anotjo inmediato.La vaina es que no me acordaba quien cocino esta receta (fue en otra vida, cuando yo cocinaba para las masas y tenia bastantes cocineros/chefs invitados que me ayudaban, larga historia) . Asi que empece a googliar y encontre esta receta perfecta en Epicurious.com….